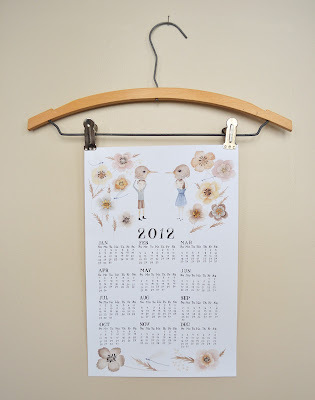 It's already getting towards the end of November, but don't worry if you still don't have a calendar for 2012, because there are still plenty of great ones out there. 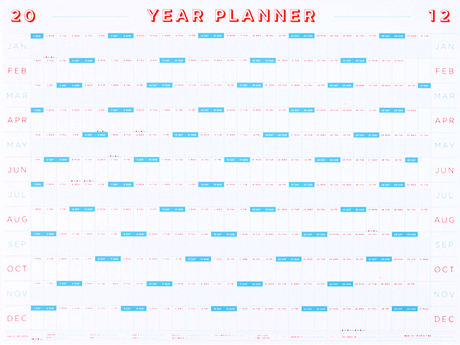 For today's post, we're going to look at year-at-a-glance calendars. 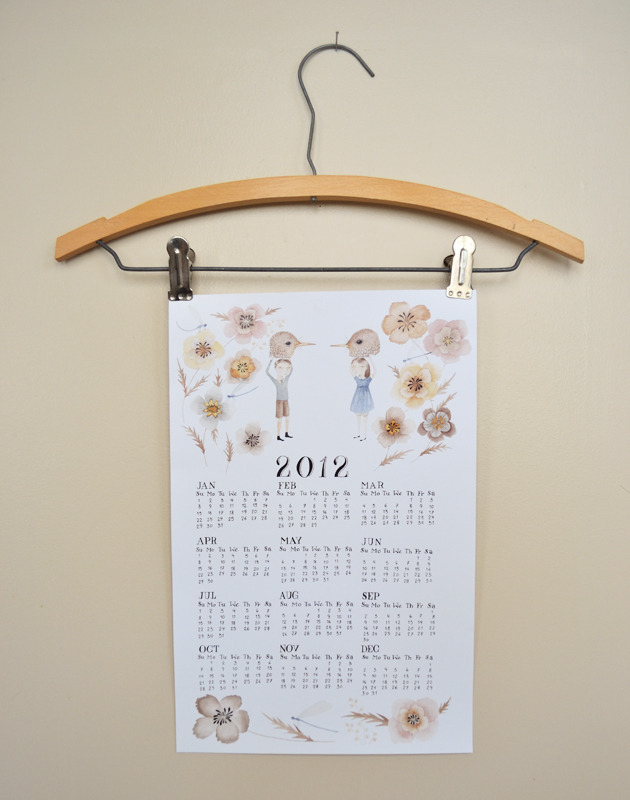 While I personally prefer a calendar whose image changes on a monthly basis, these are all just too beautiful to miss. 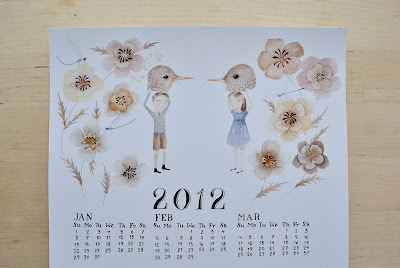 The artwork of Julianna, of Oh My Cavalier, has long been a favorite of mine, but I think that her 2012 Bird Children calendar, with its watercolor illustrations and hand lettering, is particularly gorgeous. Definitely a calendar that I'd be happy to spend an entire year with. 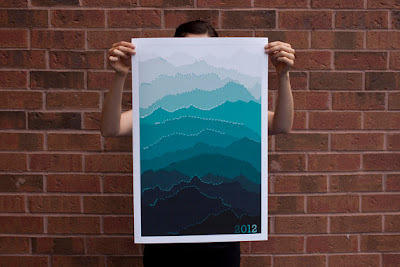 Next up is Pam Lostracco's colorful mountain calendars. Inspired by the mountains of Laos and Thailand, these soothing poster-sized vistas are available in sea green, blue mist and red sunset. 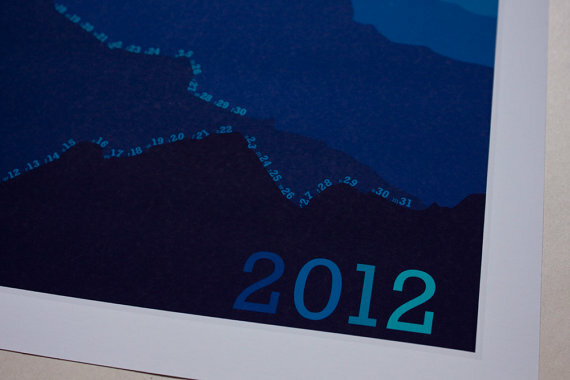 And from poster-sized, we move on to over-sized. 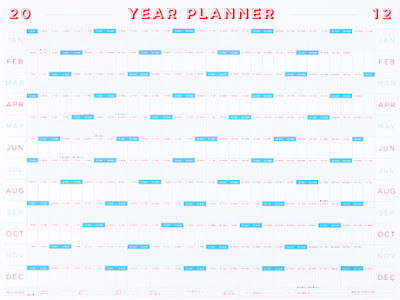 The 2012 wall planner, from Present&Correct, which measures 997x700mm, is large enough to help you plan out your entire year in style. 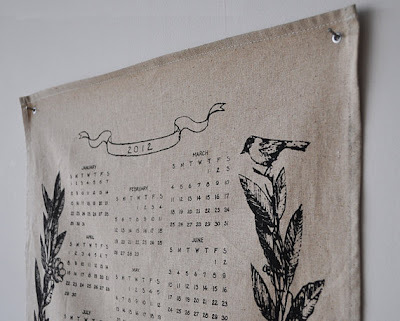 And finally, instead of paper, how about a linen calendar, from bookhou? 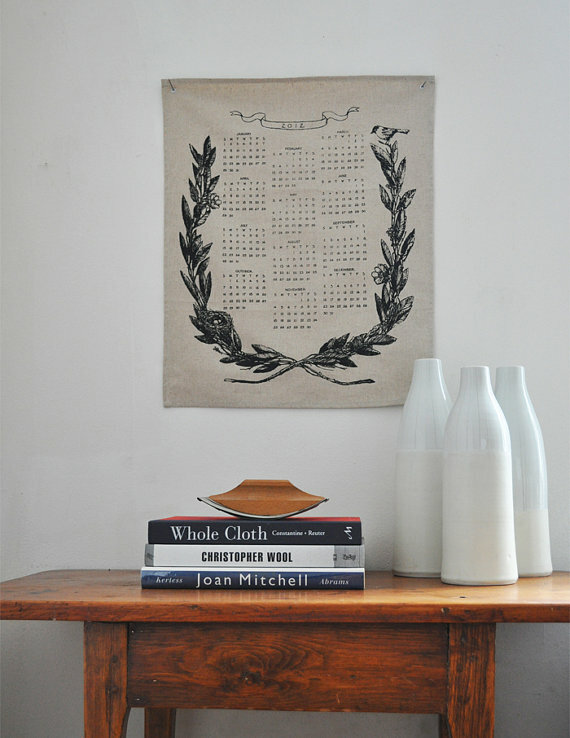 With its handsome laurels and simple charms, it's definitely an appealing option. 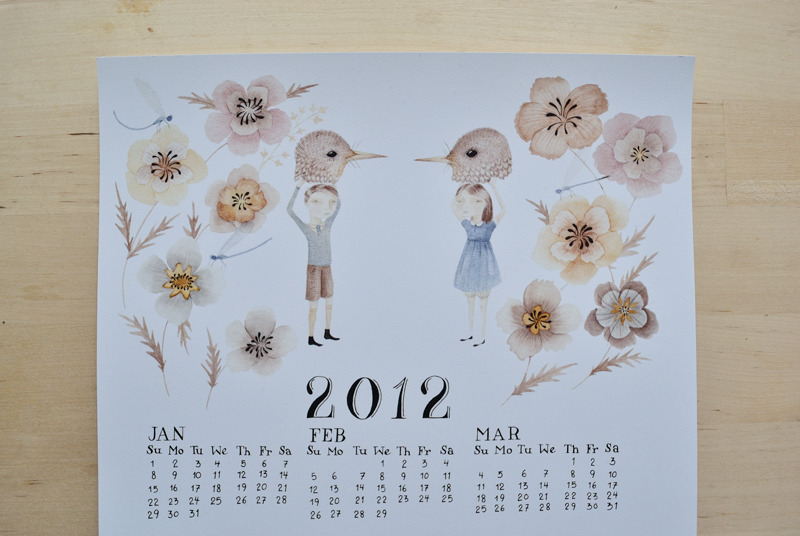 Of course, if you're not into the whole year-at-a-glace thing, there's always bookhou's pretty, monthly paper calendar as well. Thanks for your comments - they mean the world to me! Header design by Ivy Fuld. Hello! I'm Sarah. This little blog is my excuse to write about some of the great artists, craftsmen and designers out there, and to share all of the miscellaneous goodness that I come across. These are the things that excite and inspire me. Thanks for stopping by. 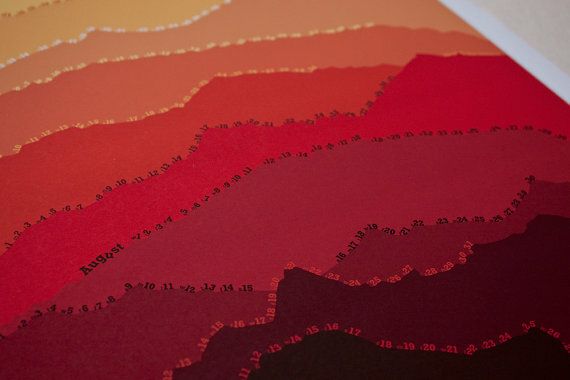 November's Designer of the Month is the fashion and design label Marimekko! A way to showcase the work of one designer for an entire month, I'll post a little bit about the person each Friday. October's Designer of the Month was glass artist Harvey Littleton. 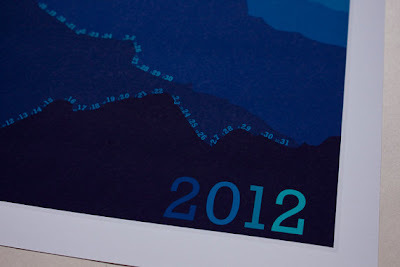 For past Designer of the Month posts, click here.